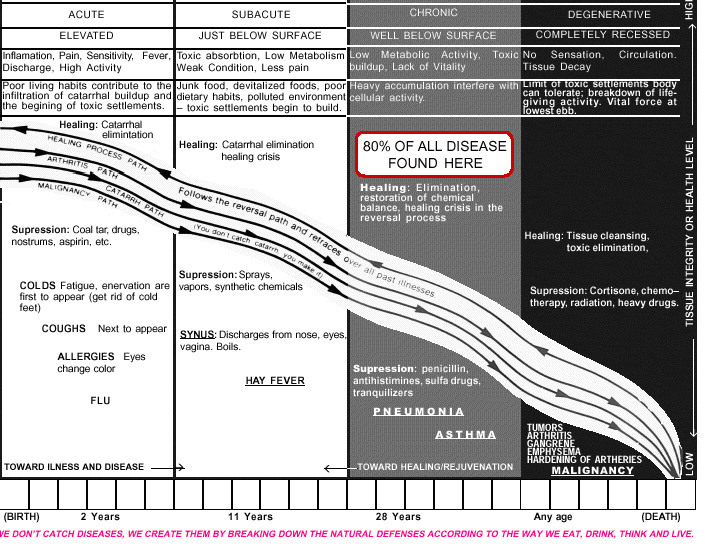 All chronic and degenerative diseases follow the same path of enervation and chemical depletion along with suppression of vital nerve force. All healing starts with the elimination of toxic wastes and removing the darkness found in the iris. True healing is a cleansing and building process. Cure is an ideal that we must constantly strive for. Diseases cannot be cured in anyone who practices degenerative lifestyle habits. There is no one specific cause that produces any specific disease nor is there any of the treatment that will correct any one disease. Man is a holistic being composed of body, mind and soul. Treatments should be noninvasive, nontoxic, holistically oriented such as; nutritional, homeopathic, naturopathic, osteopathic, massage, structural, exercise, reflexive, acupuncture, hydrotherapeutic, physiotherapeutic, herbal, vibrational (music and color, etc.) geographic, climatic, spiritual, philosophical, etc. These treatments are designed to promote the retracing process to attain higher health levels. All the holistic treatments strive to re- establish balance and equilibrium to develop light in dark places. This is the path of Hearing’s Law of Cure. When the body is treated properly, we come out of degeneracy (darkness) to a lighter eye and good health. Iridology leads the way in demonstrating the principle. In iridology we change all dark places to light. Goethe’s last words were: “God give man light”. What prevents a disease will cure a disease. All chronic and degenerative diseases follow the same path of enervation and chemical depletion along with suppression of vital nerve force. All healing starts with the elimination of toxic wastes and removing the darkness found in the iris. True healing is a cleansing and building process. Cure is an ideal that we must constantly strive for. Without ideal we become sick, aged and die prematurely. Always welcome a catarrhal discharge. It’s nature’s way of elimination. It all depends upon the path you take.